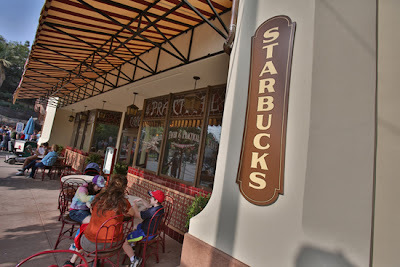 Disney has confirmed that the Main Street Bakery at the Magic Kingdom will become home to Walt Disney World's first Starbucks location. Set to close in January 2013, the Main Street Bakery will then reopen as Starbucks in the early summer of 2013. Also announced was the Fountain View in Epcot's Future World will be home to the second Starbucks. Both locations will offer the full complement of Starbucks signature beverages, artisan breakfast sandwiches and a wide selection of baked goods, including muffins, scones and specialty treats. They will also be themed to fit their surroundings. Originally announced back in April 2012, the first location opened at the Disneyland Resort in California. There are plans for their to be a Starbucks in all six of the domestic parks. NOOOOOO!!!!! Not the Fountainview!! Where will we get ice cream cones????? Yes. Sad to say that most of us that have been following this story expected Fountainview to be the location. No word on where they will move the ice cream but I'll stay on top of it! Thanks for reading! Thanks for writing! :^) BTW, your Buddy Curt says "Hi, Mike". I'm beyond excited about this! I am too - Even though Main Street Bakery and Fountainview are popular areas, I think it's a great partnership!